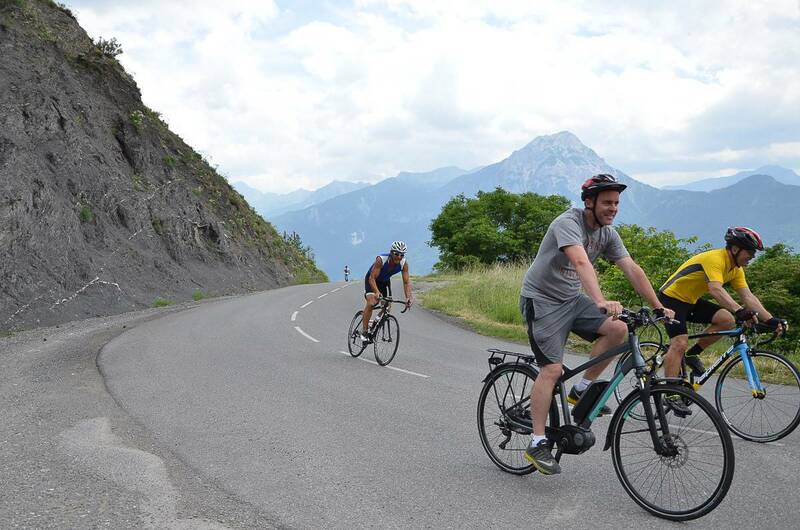 A full week cycling classic Tour de France cols at your own pace with the assistance of an e-bike. You'll be staying in our client's favourite B&B, famous for its delicious cuisine! 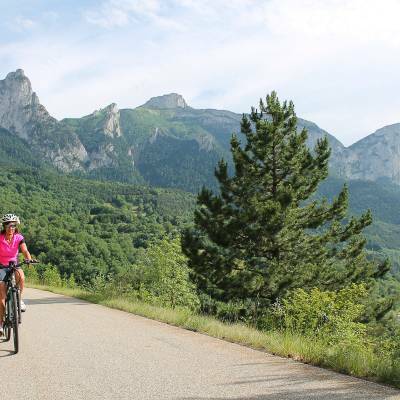 On this trip you can become the King or Queen of the Mountains and not just any old mountains, the French Alps. 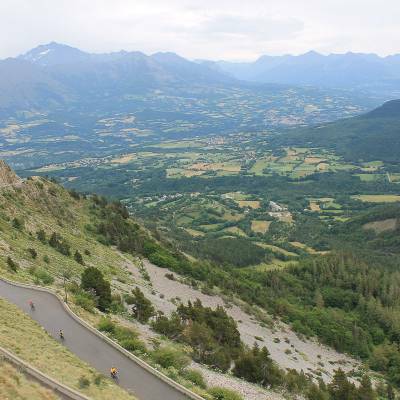 Yes you can achieve this grand Strava title without breaking a sweat - well maybe a little perspiration just for the look! The secret? An E-bike! 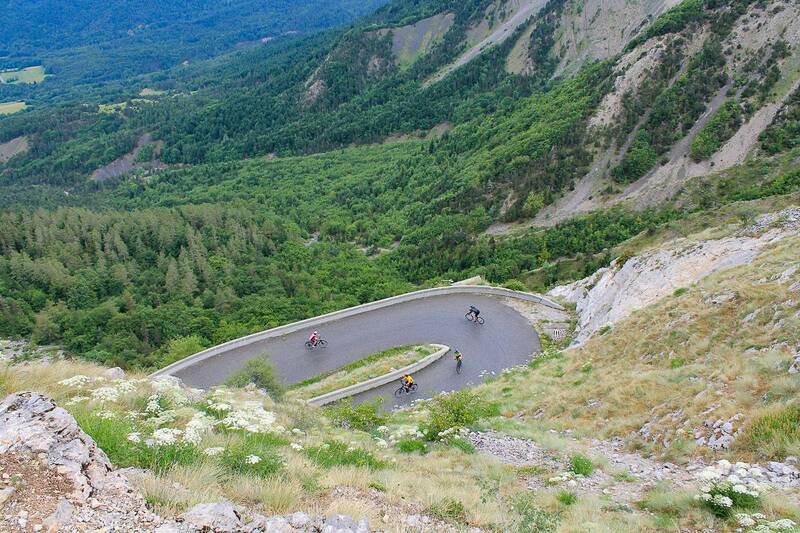 Of course you can do this trip on a classic roadie but... you choose! Duncan Craig from the Sunday Times tested out the trip. 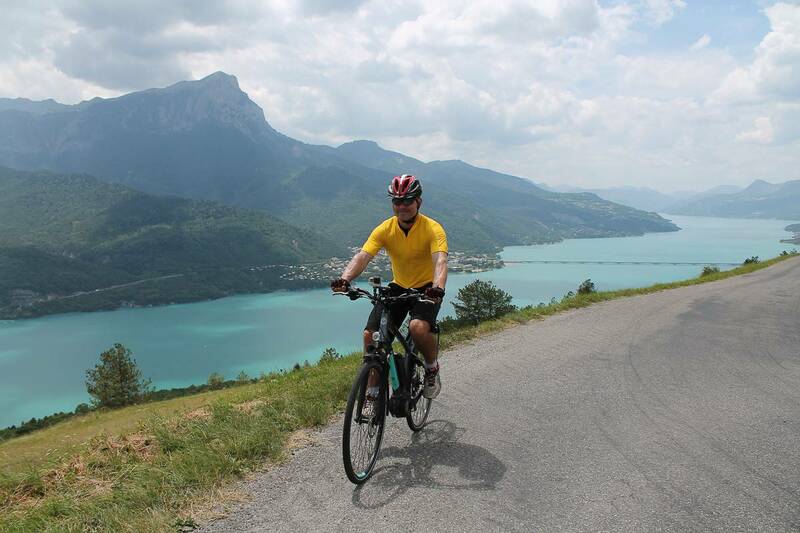 Here's what he thought about riding the Tour de France cols on an e-bike! You can also have a look at the little video he made for the Sunday Times website. 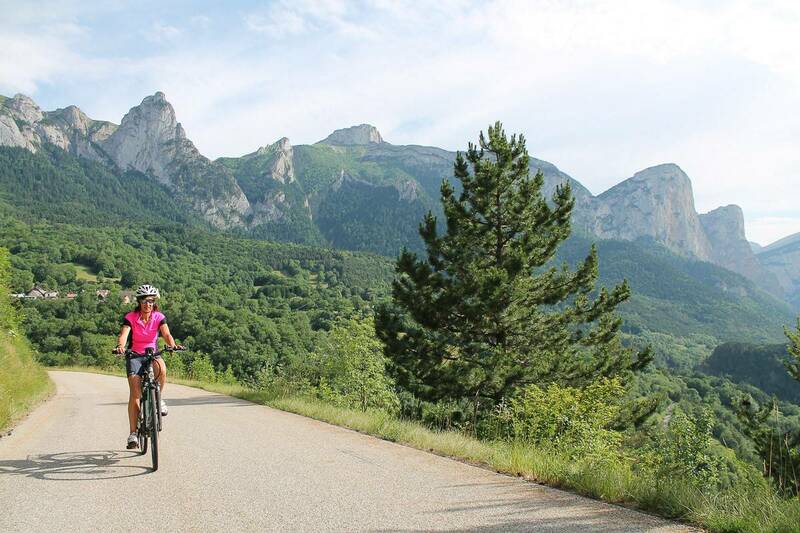 Cycling in France is a national pass-time and following in the wheels of the professional cycling heroes of the Tour de France is a bucket list activity for many fans. 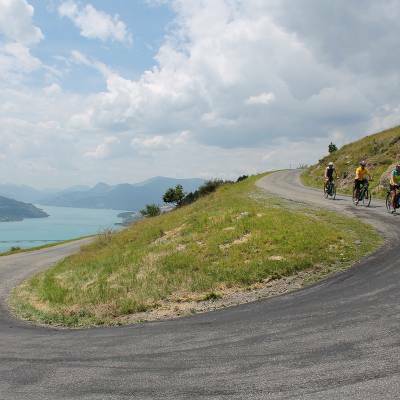 Most Tour de France tours and cycling holidays in France are aimed at experienced and competitive cyclists but this e-bike trip is perfect for moderate bikers and novice cyclists or retired experienced road cyclists who still want the buzz of climbing to the top of a big Alpine pass but don't quite have the legs for it any more! 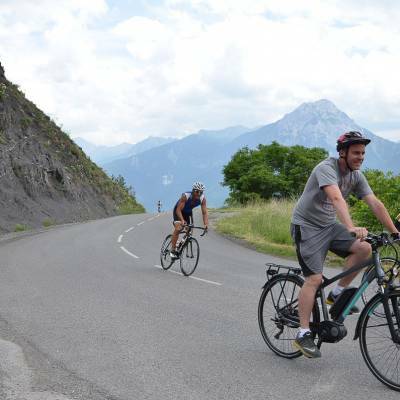 Electric bikes have taken off in the Alps and it is now as common to see 'normal' people on e-bikes powering up the big climbs as the lycra clad pros! 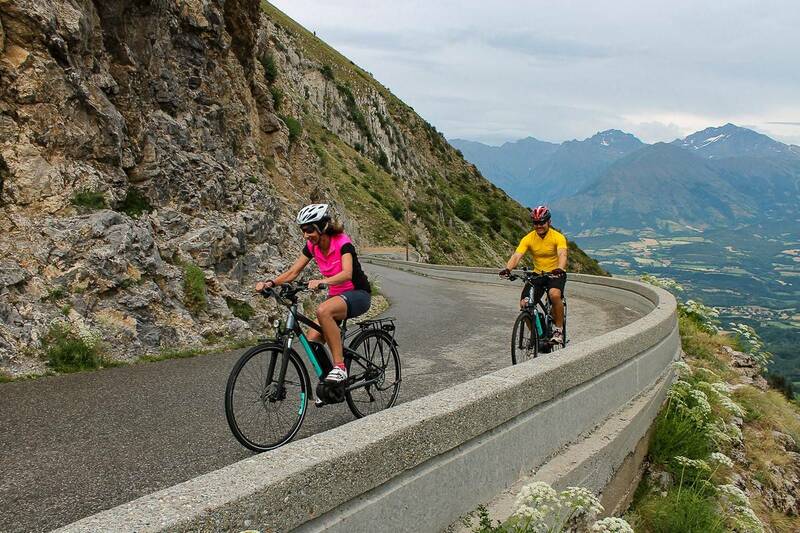 E-biking holidays and e-bike touring are the new biking holiday must dos in the Alps! 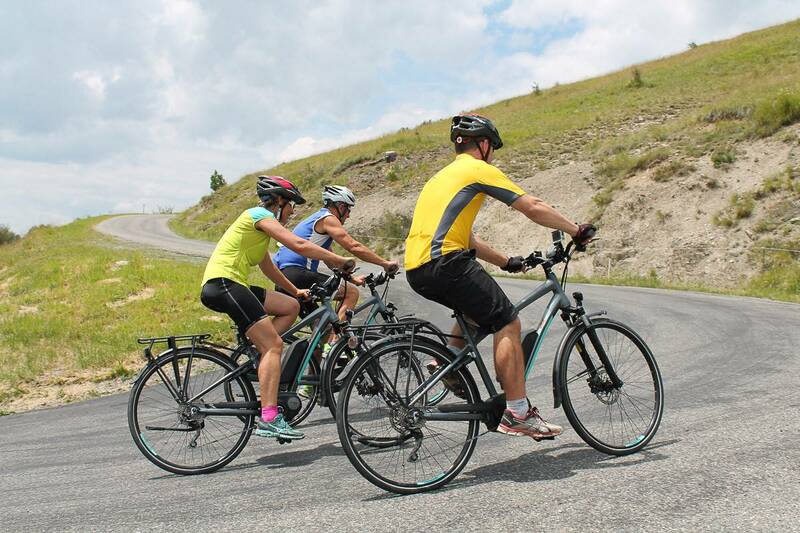 Read our blog article about why e-biking is so popular in the Alps. 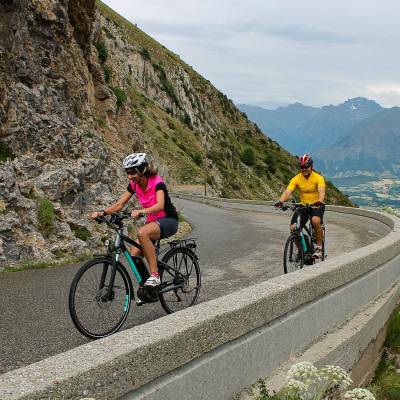 This e-biking holiday takes in the famous 21 hairpin bends of Alpe d'Huez, explore the mythical moonscape of the Col d'Izoard, discover one of Chris Froome's favourite cols, the col du Noyer, and pitch yourself against his time trial route around the Serre-Ponçon lake. Will you be able to beat his time on an E-bike? 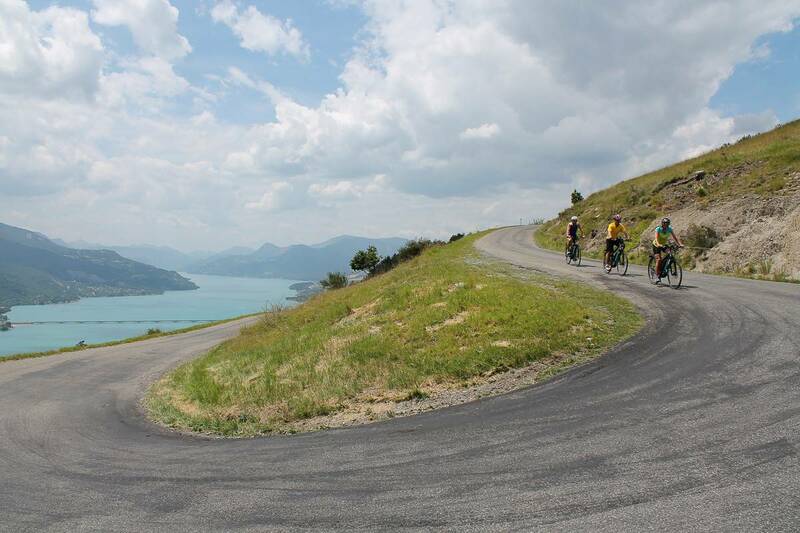 There will also be the option of trying Mont-Colombis, the toughest road cycling climb in France! 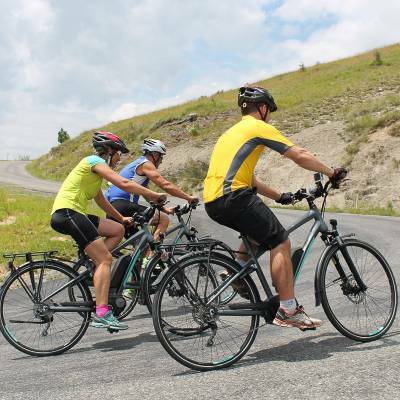 Electric bikes are still a relatively new phenomenon and sometimes a little misunderstood. They are not motorbikes, you need to pedal, and it is entirely up to you how much extra oomph you give yourself from the battery. 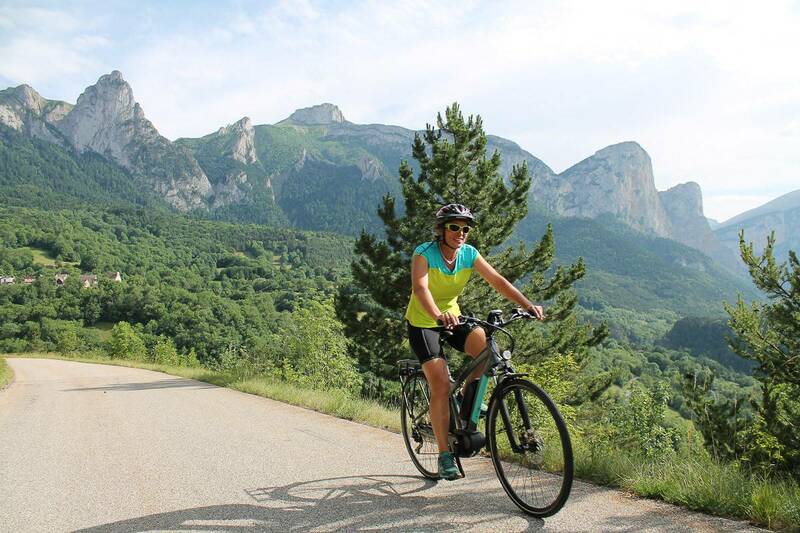 To do a big mountain col you will still need a reasonable level of fitness with an E-bike (be a regular dog walker or gym goer) - it is not cheating! 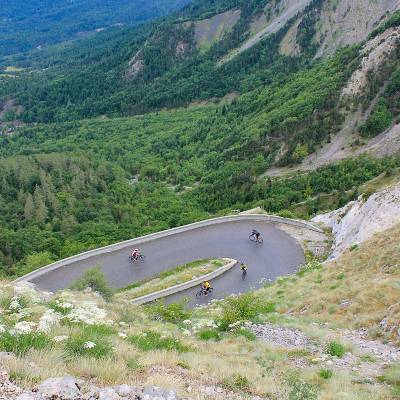 This trip will take you over some of the mythical Tour de France cols with the option of adding extra sections on if you wish. 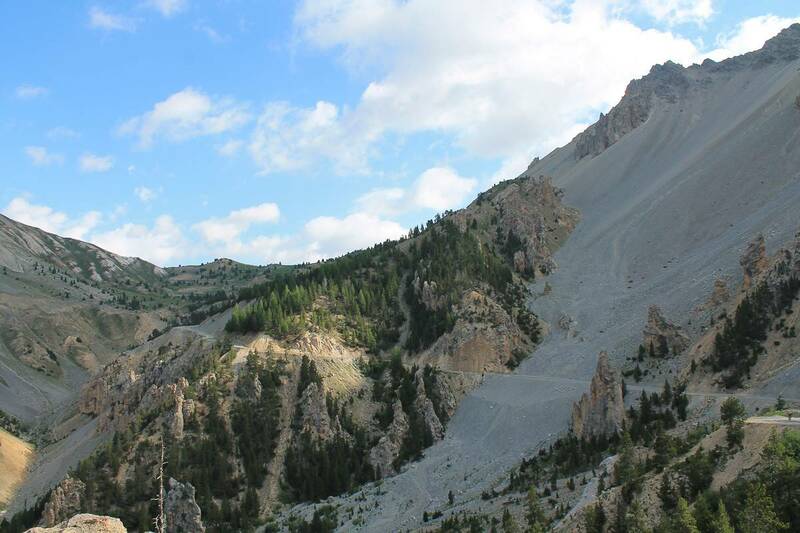 You have vehicle support with you at all times guiding the way and there to carry your snacks, spare clothing and tool kits and to pick you up if you have had enough. There's no excuse not to give it a go! 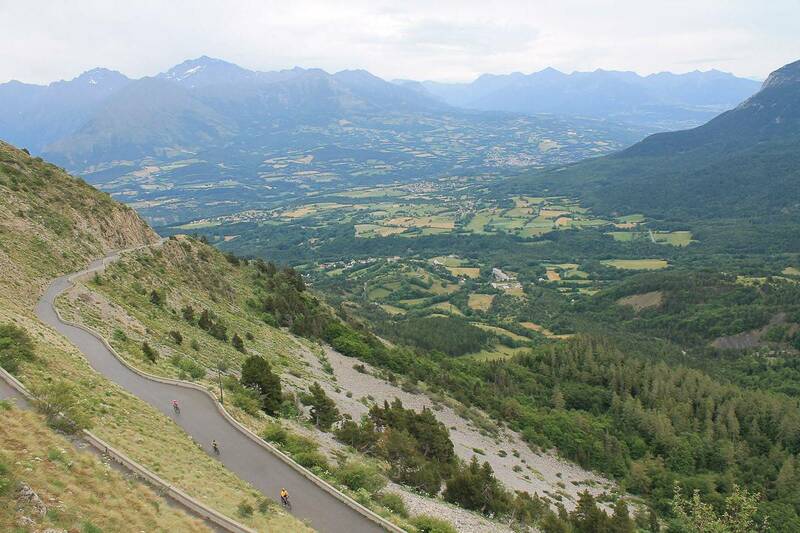 Last but not least and because we think that a proper holiday should always include great food, the accommodation we chose (the lovely Grange des Ecrins) for this tour is our clients' favourite since 2015. The owners Jean&Meg are wonderful people and their cuisine, an innovative mix of delicious local and world products, has quickly become renowned in the region. 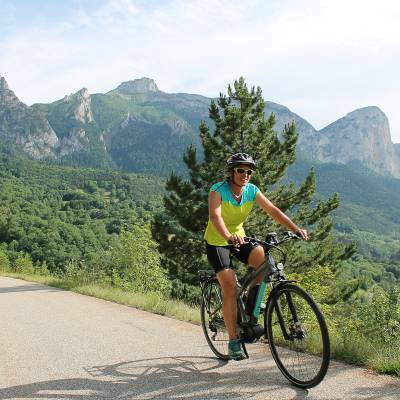 Not only can you become the King or Queen of the Mountains on your e-bike - you'll be treated as a King or Queen at the Grange des Ecrins too! 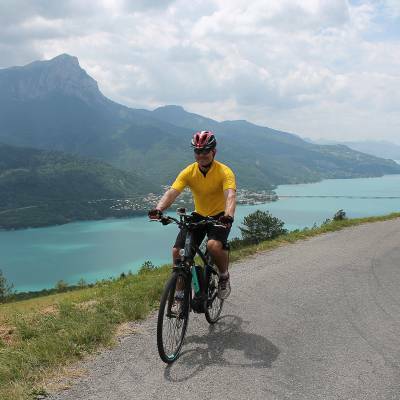 If you like the idea of e-biking the Alps but would prefer a fully tailor made itinerary, then have a look at our flexible e-bike the Alps holiday! 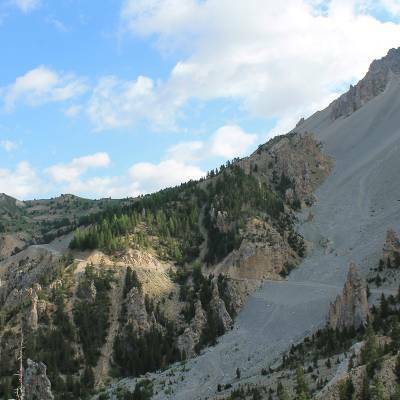 We will collect you from Gap train station which has rail links from Grenoble, Valence and Aix-en-Provence TGVs and also a direct overnight sleeper service from Paris. 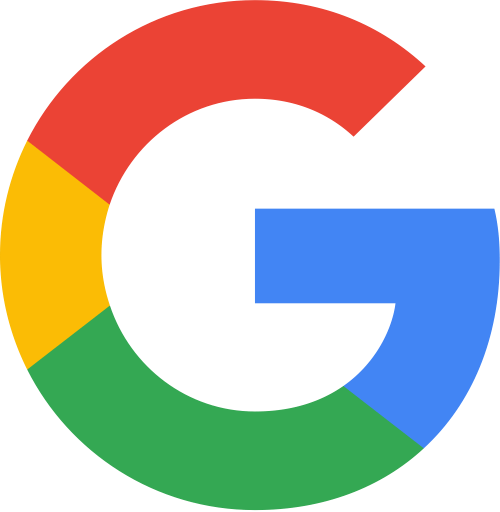 If you are flying here, the best airport to fly to is Marseilles and there is a regular shuttle directly from the airport to Gap.